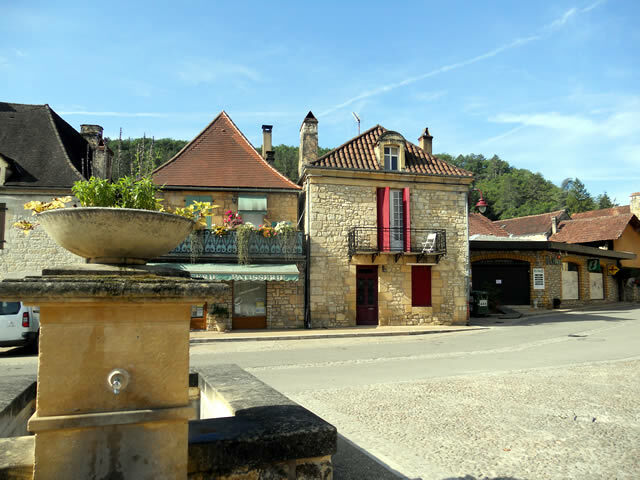 More Hidden Gems of Sarlat and this weekend events. 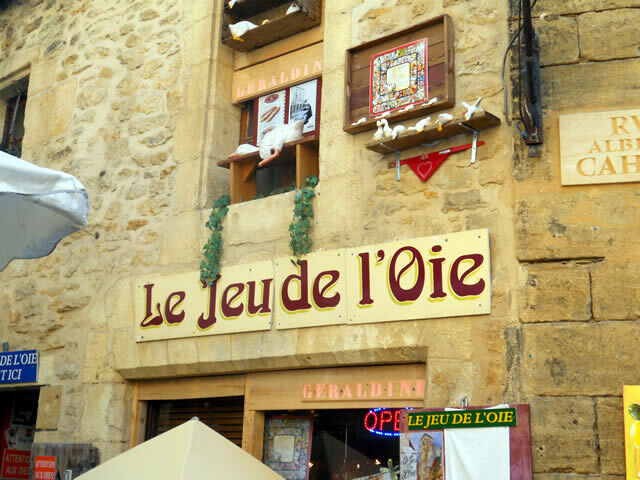 Walk down any of the medieval side streets of the old town of Sarlat and you come across the hidden gems. This “gem” is a vegetarian delight, ducks that you do not eat! The store specialises in ceramic ducks of all shapes and sizes; I particularly like the ones that hang over the side of the shelves and windows. 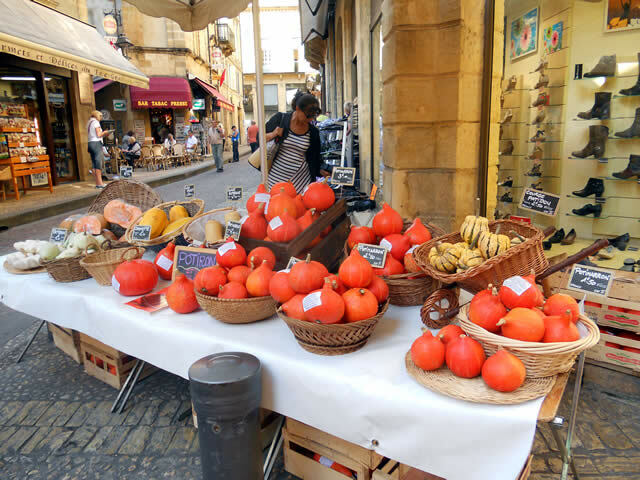 We were late shopping in Sarlat this particular day so after a trip to the market for the fresh produce it was time for lunch. Our first thought was to try to find a restaurant down one of the winding side streets which we had not visited before. There are a lot to choose from. We had to look for a restaurant that caters for both meat eaters and vegetarian, Paul eats meat and I do not. Which is difficult to find, I do eat fish though which does make the decision easier. As a ‘vegi’ and bird lover I had to persevere past the many duck menus but there are a variety of gorgeous meals to find, and this is where we stopped for lunch. 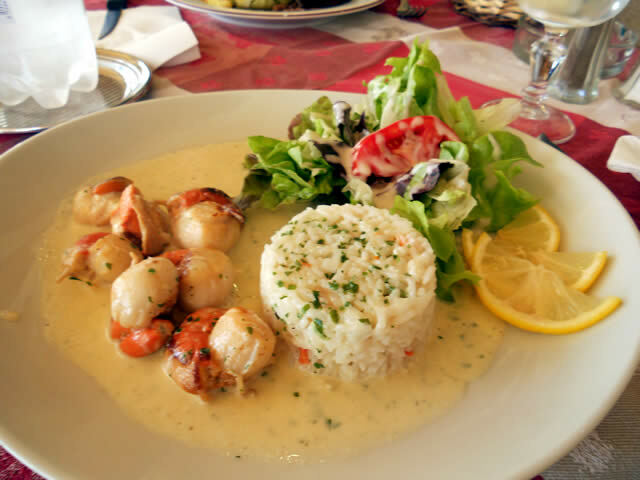 This was my dish, scallops, rice with salad in a cream sauce. Although delicious, the salad was covered with vinaigrette which did not go with the cream sauce. 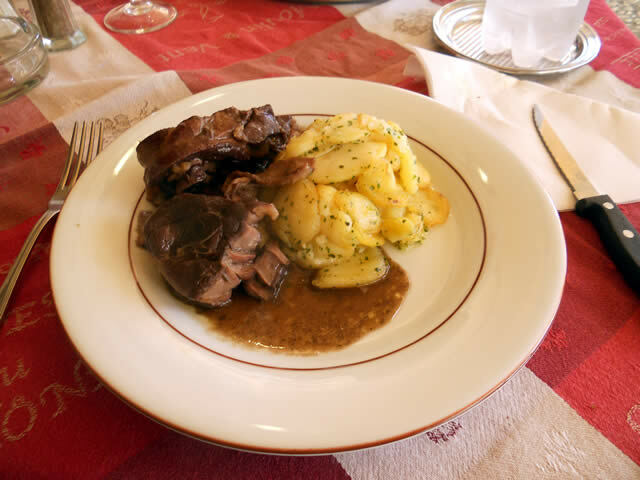 Paul’s was a beef dish with lots of potatoes and mushrooms. He said that the meat was very tender and also delicious. We did not have dessert, they looked very tempting but we were trying not to put on the calories… too much. 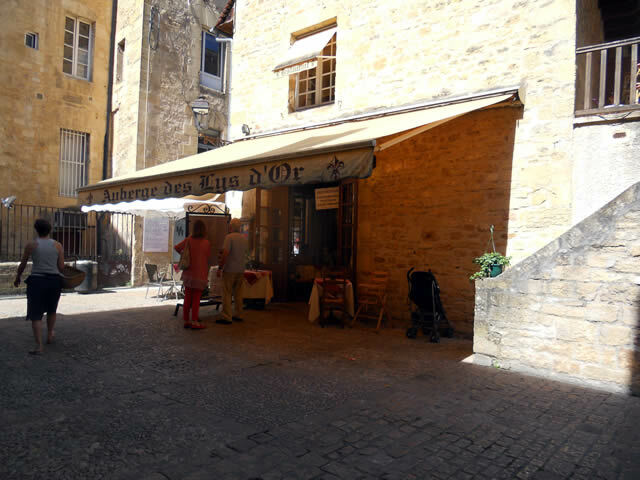 This was the start of another side street that leads to the main shopping area of Sarlat. The variety of squashes and the colour was amazing. You can just see the pumpkins on the left of the picture, which were cut up into pieces for people to buy. 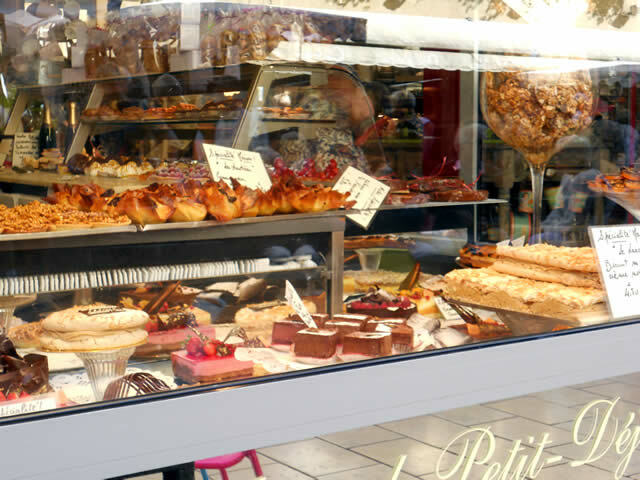 A favourite Patisserie which is found down the main street in Sarlat, I did not buy any cakes but I love to stop and look at the artistry of the baker. We stopped for a coffee and sat outside to watch the world go by on market day. Also in Sarlat, a Brocante on the same day. The kitchen is slowly coming together, it has taken years but we are nearly there. 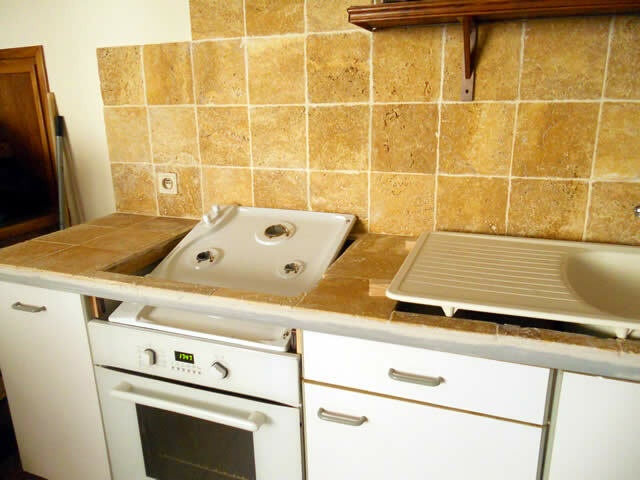 One of our tasks on our last trip was to complete the tiling of the worktop, grout it, seal it and place a trim all the way around the top. Sounds not too bad however it was difficult due to the fact that we had to lift the cooker top and sink to a level where we could tile underneath. 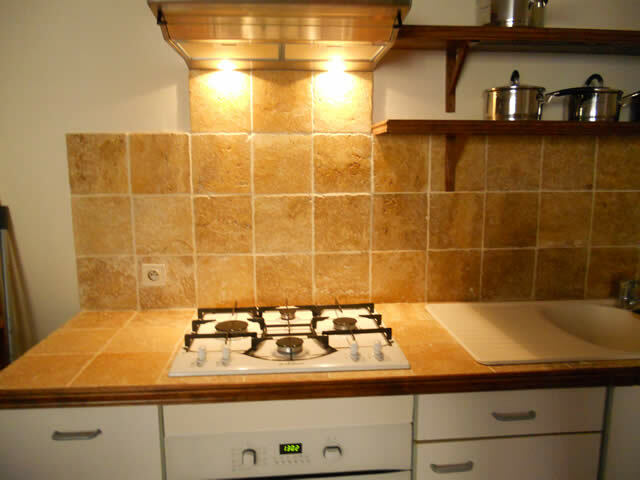 The cooker top and sink were placed onto wooden blocks. The completed work, it is looking great. We looked at various DIY stores for cupboard doors and drawers that would fit our kitchen, no luck. So I asked at the local builders if they knew of anyone that could make them for us. They were very helpful in recommending a carpenter in the next village. 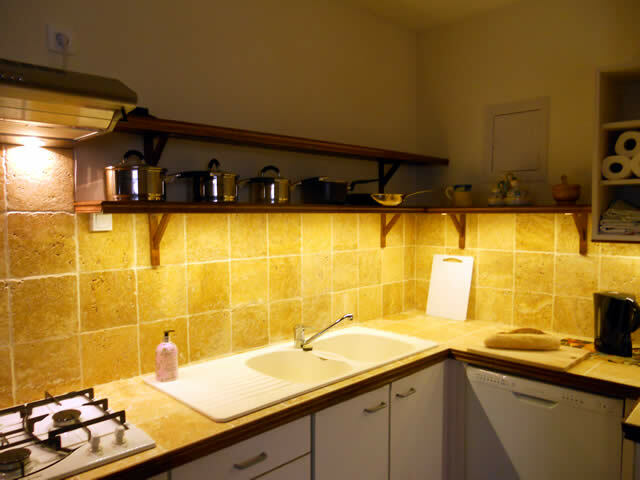 Which we found and explained what we wanted, he asked for the type of wood to be used, sizes, and photographs. So armed with all of the information the carpenter required we returned the same day. One look at the photographs was enough to tell him that he knew the house. He had made the staircase etc for the previous owner. We are now waiting for a quote to complete the final stage. 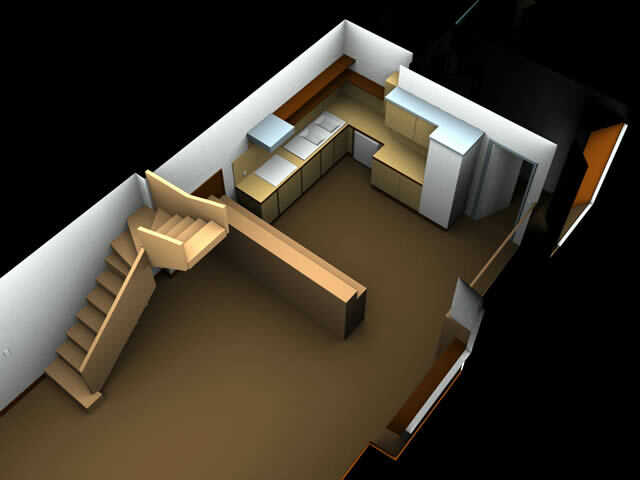 This is a 3D model of our kitchen complete with the new doors. It was developed by our very talented son and is particularly useful when I want to know if our existing furniture and new furniture will fit into our home in Daglan. 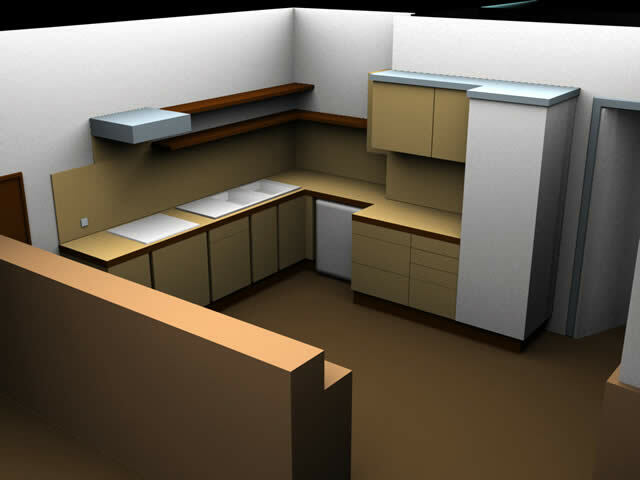 The basic colour scheme for the kitchen was helpful in choosing what type of wood and colour wood we needed for the doors and draws. A birds eye view of the kitchen and part of the lounge area. 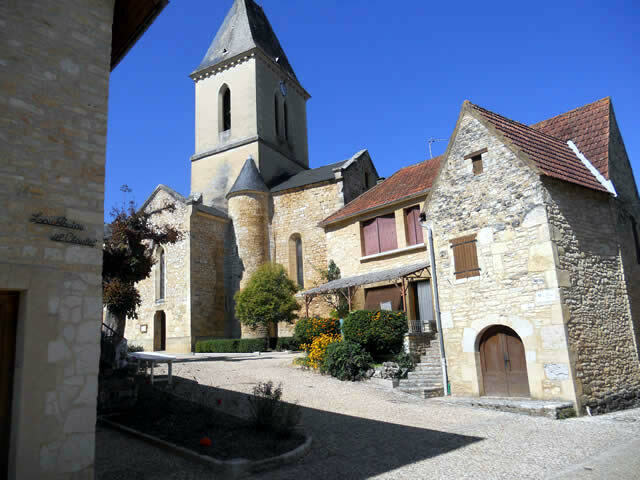 If you are in the Perigord in October or November check out the following events. Villefranche-du-Perigord-17th October, Chestnut Festival; selling roasted chestnuts, chestnut chocolates, chestnut puree. They also have a farmers market, dancing, a parade and a prize for the best chestnut cake. Villefranche-du-Perigord-26th October, Chocolate Festival. I have recently read about a Chocolate Liqueur which combines the sweetness of chocolate with cream and Bourbon vanilla, sound delicious. It is called Briottets Liqueur de Chocolate. 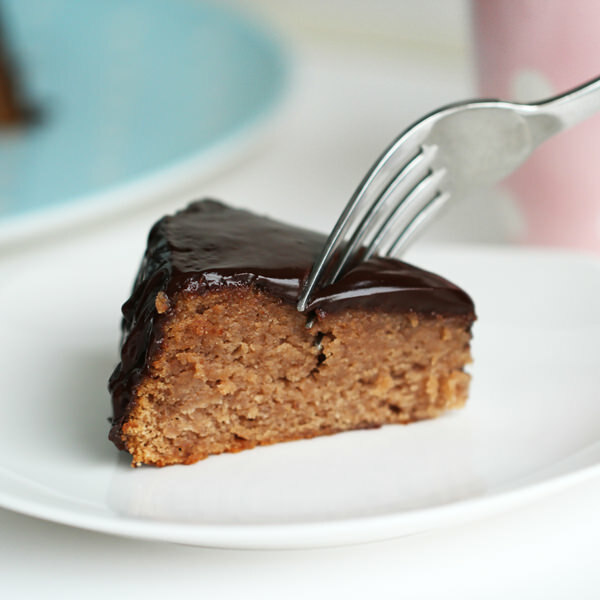 A yummy chestnut cake with chocolate ganache icing. The roof tops of Daglan are truly fascinating, each house depicting the wealth of the owner and the village in the 19th century. In particular I love the curve of the roof tops which always remind me of a witch’s hat. The carvings on the attic windows are gorgeous and are a real status symbol to Daglan in its heyday. Our home showing the witches hat roof top, which is more striking on the Patisserie next door. We have not painted the outside windows and doors yet, it’s another item on the long, long…. long to do list, so for the moment you just need to imagine duck egg blue shutters and white window frames. Daglan’s church of St. Martin with its blue topped tower and of course the sloping roof. In the early morning and at dusk swallows swoop around the church and square. They make a very interesting clinking sound as they hunt for food. Having to get up at 2:30 in order to get to Liverpool airport is always a pain in every sense of the word. However we always know that the flight will be on time when we arrive at Bergerac airport, not this time. Due to our early rise I had fallen asleep on the airplane, when I woke up and looked out of the window I soon realised that we were not going in the correct direction, in fact we were going in a circle. I think that you could call it a mild panic set in at this point, while I thought through all of the different scenarios that would explain why we were circling. This completed I thought it best to point this conundrum out to my husband who was acting rather calmly in such a stressful situation. Of course he said “I know, we have been circling Bergerac airport for the last twenty minutes”. Another slight panic set in, why? And do we have enough fuel, did spring to mind. As it transpired we could not land due to low cloud, mist on the runway and that we were now about thirty minutes late, at this point the captain informed us that we had to fly to Limoges where coaches would pick up all of the passages and transfer them to Bergerac. Which it did, panic over with we were safe but late. We thought our son would be worried, we normally text him to say that we have landed; no text would caused alarm bells to ring… it did… he looked on the flight companies website and knew the situation before us. Our very late arrival meant that we could not buy essentials because the shops would be closed for two, three or four hours so a lunch break in Bergerac was called for. Bergerac, a name which is associated with Cyrano, the poet cavalier with the big nose, but he never actually came from Bergerac or in fact visited the town where swans swim in the Dordogne River near the banks of the little port, where you can hire a gabare-a traditional flat bottom boat for a trip along the river. 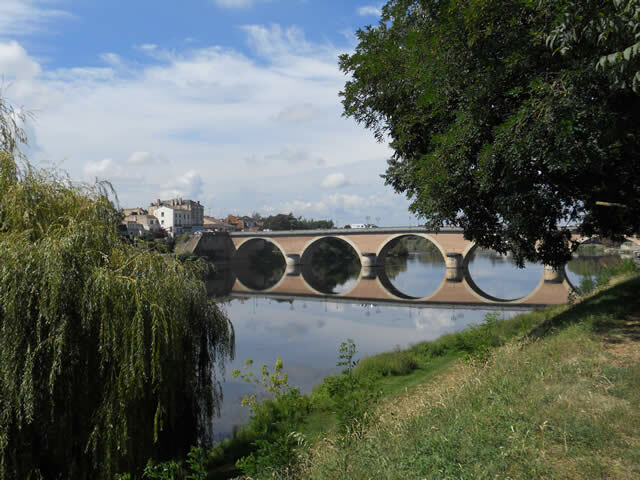 The town took off with the construction of a bridge in the 12th century, at that time it was the only bridge on the Dordogne. 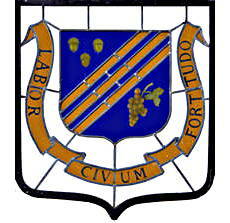 Therefore, trade grew in tobacco and wine. 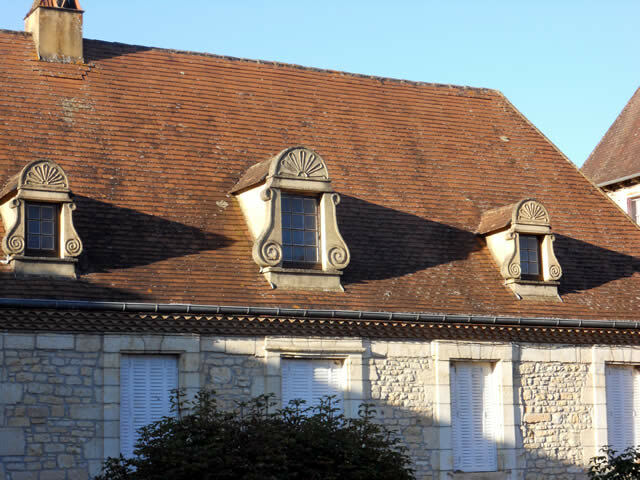 Overlooking the river is the Maison des Vins, housed in the former Cloitre des Recollets, where you can buy a bottle or two of wine. 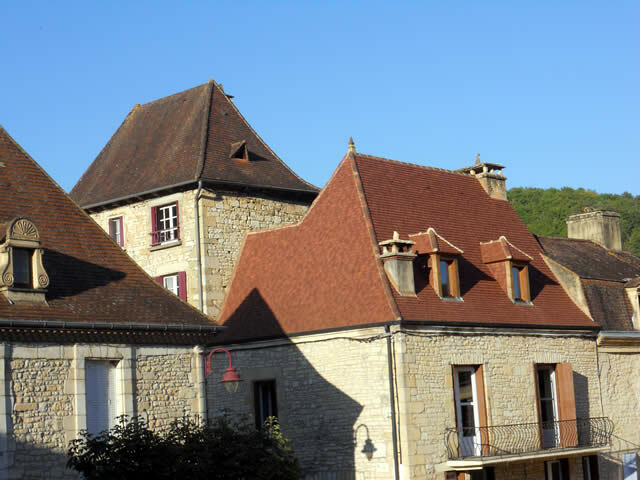 Nearby is the Maison Peyrarede which houses a tobacco museum. 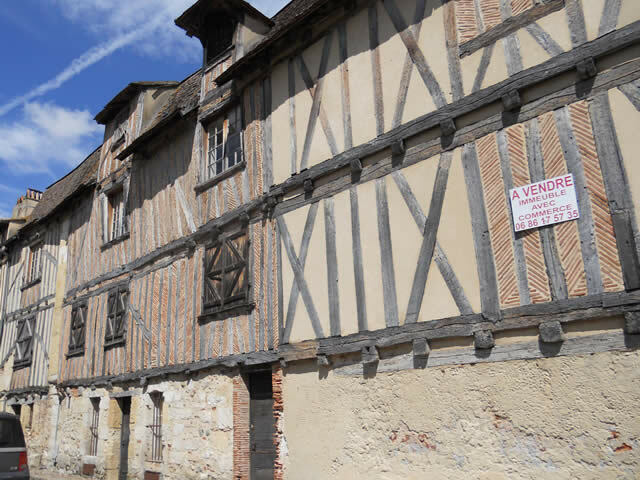 Although Bergerac occupies both banks of the Dordogne, all the interesting points for visitors are concentrated in the pedestrian zone on the North Bank, where restoration work has uncovered a handsome set of buildings from the 14th to the 15th century. A shame that they had to use a concrete base but they still look good. 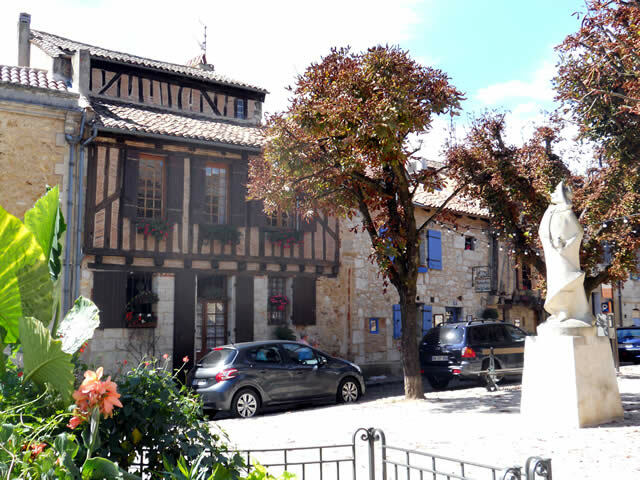 There are numerous cafes and bars in Bergerac where you can sit and watch the world go by. This statue was erected in 1977, however I think that a better statue is further up the hill in Place Pelissiere, next to Saint Jacques church. 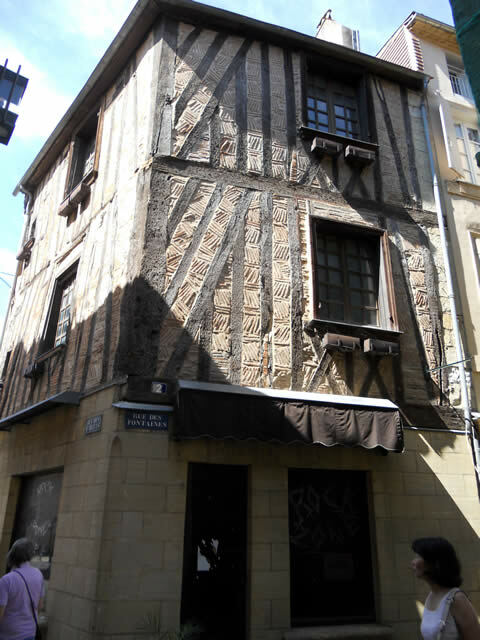 Cyrano owes his appearance here to Edmond Rostands successful play Cyrano de Bergerac (1897). 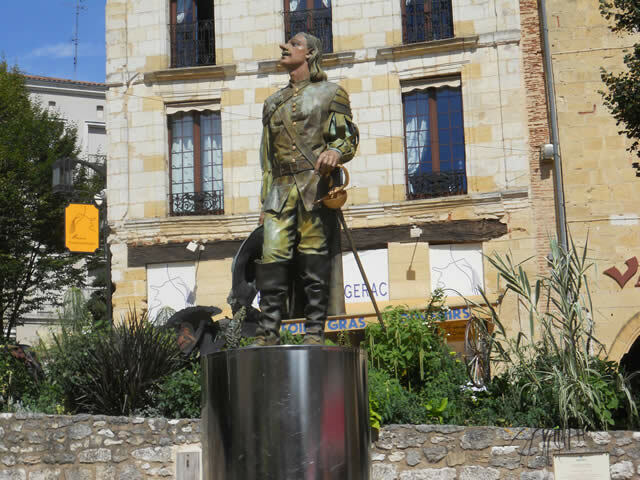 Rostand based his character on the real Savien Cyrano (1619-55), born in Paris he was a swashbuckling extrovert and poet, who was appointed as a musketeer. Here he is with his nose turned high. This was taken from a street just around the corner from the above statue where there are very interesting cafes, and shops.